Woman is so powerful, sometimes over missed. 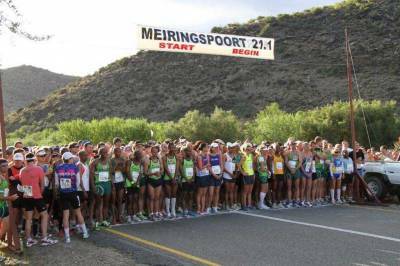 If you think of the small community of De Rust and how these woman stood together – on deciding to start the well known Meiringspoort half marathon, in 1993( 21 years ago), we can be proud to call ourselves = women. I can just imagine them running and talking having the “brainchild” of the marathon, born among them. I can just witness that so many ideas and plans from my own life , is born on the roads while I am running – believe it is all the oxygen that energise me- totally addicted to this ! Today, being one of the most popular races on the race calendar, it is understandable that on open day of the entries, the race is also sold out. The race is downhill , only the last 4 km is uphill. What make this race very unique, is that the athletes is being transported in big trucks early in the morning by local farmers and supporting vehicles to the starting point of the 21.1 and 10 km. Athletes have the opportunity to run or walk. The scenery while running, and to watch the rock formations from the majestic Swartberg mountains, is awesome and a person feel so small and blessed for God’s wonderful creations and how He spoilsed us in so many ways, we just have to look around us, to see and appreciate all of it. During the first three years Isaac Opperman from Wellington was the winner. The route record, 1:04:06 set by him in 1994, has not been improved since. De Zeekoe Guest Farm had the opportunity to be one of the sponsors on this event , and had their own water station where the staff gave out water, coke, oranges and bananas. They played music and also children made music on instruments that they made themselves. De Zeekoe’s staff and Meerkat Mascot had lots of fun entertaining the runners and helping them to finish line before cut-off time, so that they can receive their medals. In fact this was also a good team building event for De Zeekoe Guest Farm’s staff. All this entertainment, leads to De Zeekoe Guest Farm winning the day with the best water stall. Afterwards a lot of lucky draws where being held which also amount to great fun and entertainment for the 3000 athletes and their support teams. Everything is well organised , big Markies tents all over ,artists with great music , all add to a festival atmosphere. There is enough parking place for the cars and for the tired runners more than enough showers. The Dutch Reformed church always have on this day also their bazaar ,and offer a wide variety of food and drinks. The committee of this event donate a lot of money towards under privileged persons in their society , an example for each of us. On 11 October 2014, De Zeekoe had the opportunity, as a sponsor, to serve the athletes at a water station. It was the 22nd time that the marathon took place and by now a very big event in the runner’s society. De Zeekoe’s staff and meerkat mascot had lots of fun entertaining the runners and helping to finish in time. A 21.1km and a 10km is on offer for the athletes. Runners is driven to the start lines in trucks, that is provided by the local farmers from the area, and are cause for great excitement.